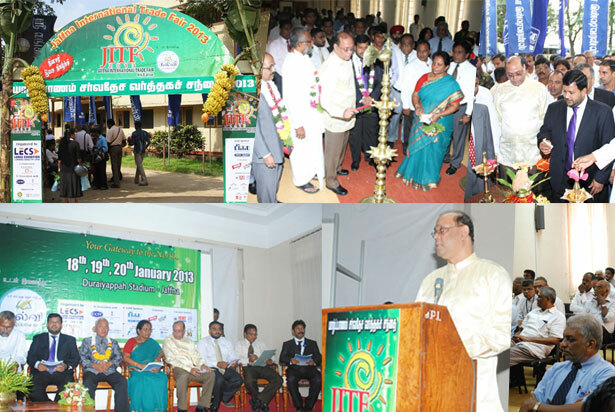 The 4th Edition of the Jaffna International Trade Fair (JITF), organized by the LECS and FCCISL successfully concluded in Jaffna, Durayappah Stadium. JITF is a platform for all the stakeholders of “doing business in Jaffna” to exhibit and sell products & services to a less exposed market, build network and new partnerships. A Business Forum was organized by the Federation of Chambers of Commerce and Industry of Sri Lanka concurrent to the Trade Fair, to disseminate knowledge on investment opportunities and doing business in Northern Region. The forum held at the Public Library, Jaffna was consisted three sessions and were presented by Mr. V. Sivagnanasothy, Secretary, Ministry of Traditional Industries and Small Enterprises on Role of the Ministry to Protect in Traditional and Small Enterprises by, Mr. Priyantha Gunesekara, General Manager, Ceylon Electricity Board, Northern Province on Enhancing the Quality of Energy Services in Northern and Mr. Tushara Jayaratne, Asst. Director, External Relations and Market Development, Security & Exchange Commission on Invest in Stock Market. The audience of the forum was consisted from trade delegation from Tamilnadu, SMEs, entrepreneurs, traders, investors and visitors. The forum was an opportunity to interact with different stakeholders and receive a mileage from the presenters and the audience. Speaking at the forum, Mr. Sivagnanasothy explained how the Traditional Ministry is getting involved in the Divi Neguma Programme and mentioned that 5 line ministries are in line. They are Ministry of Economic Development, Ministry of Traditional Industries and Small Enterprises, Ministry of Industry and Commerce, Ministry of State Resources and Enterprise Development and Ministry of Technology and Research. The secretary also mentioned that the objective of the programme is developing Poverty Free World by 2016 and cottage industries are prioritized in achieving of the goal. One product one village concept is being practiced as to all resources and facilities are focused in to a one village. He has stated that the buy-back arrangements will be made in order to provide a full package for the beneficiaries of the prgramme. The exhibitions and forums of this nature helps to assess the need of the local people, provide technical training and networking. Mr.Gunasekara from CEB elaborated on Peak Power Demand in Northern Province, accordingly Jaffna – 40.5 MW, Kilinochchi – 2.4 MW, Mullaiththivu – 2.3 MW, Vavuniya – 11.3 MW and Mannar – 5.6 MW. Grid Substations in Vavuniya , Kilinochchi are available and Chunnakam is planned to complete by 2013 and Mannar by 2016. He also said the entire Peninsula will be connected to the National Grid by end of this year. Even though 17 MW is contributred from Hydro, CEB can not cater the loads. This is planned to be sorted out, when the CEB’s 24MW project is commissioned in February 2013. He also said that interruptions are forced to impose to the system because of the road widening works. Now road widening works are almost finished but may take some time to sort out . It was observed severe voltage drop in Mannar occurred presently. A Voltage Regulator is need to be installed nearby Murungan to overcome this issue. Highest number of Tripping is observed in Mannar but compared to the past, tripping is declining at the moment. After commissioning the GSS in 2016 , entire problems are expected to be solved. A 3 year half tax holiday for new companies that will be listed on the Colombo Stock Exchange before December 2013, and maintain a minimum of 20 percent of its shares with the public. Permit Stockbrokers to claim lump sum depreciation for expenditure on IT infrastructure, branch networking, and such other capital items. The Roadmap for the coming years for CSE are stated as Expedite SEC Act amendments, List large companies, Attract new funds (foreign and local), Develop Infrastructure and the Corporate Debt Market, Intensify education and awareness, Develop Unit Trusts, Strengthen Risk Management systems, Develop new products (derivatives, ETF, commodities) and Demutualize the CSE.